Smoke Fairies at The Lexington 1st February 2010 – IS YOUR CLAM IN A JAM? As I said yesterday in my “Ones to Watch in 2010” post, The Smoke Fairies are one of the most exciting new bands at the moment. Playing infectious Folk Blues topped by angelic voices, at times in unison, at times harmonizing with each other, the Smoke Fairies are a touching and special experience to see live. As I arrived at The Lexington in Pentonville Road at around 8.15 and quickly bought my ticket, fearing the show had already started i rushed to the concert room upstairs only to find a few people listening to young Natalie Evans, a ginger haired teenage folk minstrel, playing such soft and sweet songs that the audience had to whisper when ordering a drink at the bar. 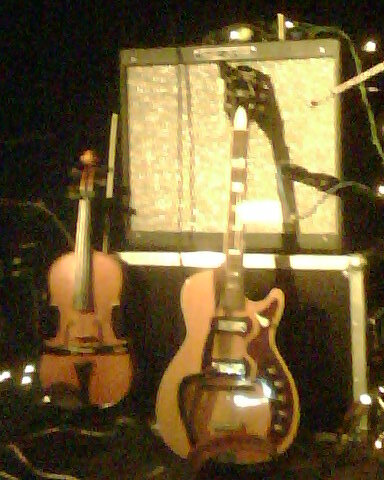 I then found out that the Smoke Fairies were not to play before 9.30 and there was another opening act, Matthew Robins. Matthew Robins sings fairy tales of made up characters such as Fly-Boy, Moth-Boy, Wolves and Butchers, plays a piano/organ in a school blazer, wears no shoes and his friend shows illustrations on an overhead projector for the show. Extravagant? Maybe if you really, really, really dug up your inner child. Finally after the fairy tales, come the Smoke Fairies, impeccably dressed as Southern Belles. After a brief introduction they started the show with single Frozen Heart, followed by their most famous song to date, Gas Town, which received the warmest response from the audience, with punters all around saying that this is the song they came to hear; and some were even hoping for Jack White to show up to play the drums for them but needless to say he didn’t. The Faries were accompanied by three more band members: a bass player, a drummer and a viola player, adding texture to their sound. After a few new songs which will be included in a forthcoming album, to “be recorded on an island which can only be reached by boat”, the Smoke Fairies kept playing their wonderful vintage guitars, mixing new and older songs from their repertoire. 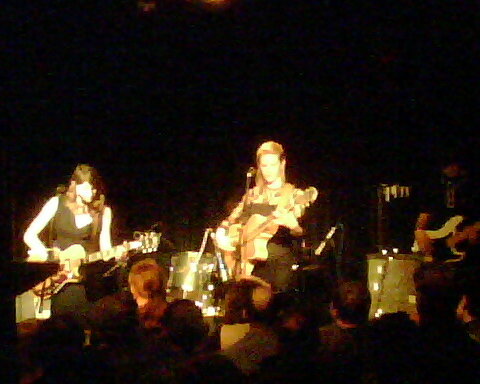 During the entirety of the show the Smoke Fairies kept relaxed and their onstage banter was quiet and friendly, the girls are very humble and sweet in the way they talk to the audience, explaining they only have cheese and whiskey in their rider, and making fun of their band T-Shirts. They then went on to play the wonderfully sweet Morning Light with a light and melodic repetitive riff that keeps going through the song. River Song, B-side to Gas Town also had Jack White playing drums in the recorded version and was well played tonight, although it missed the fiendish guitar solo at the song’s coda that Mr White plays on the record. After a brief pause the Fairies came back onstage for their encore, playing the wonderful Fences, mixing one finger-picking guitar with a bottle-neck riff that keeps the song going. The concert ended with an unanimous cheer from an enthusiastic crowd, which know they have just witnessed something special, as the Smoke Fairies can take you to a clear night on a Western praire with buffalo roaming and coyotes howling with their hauntingly sweet songs.